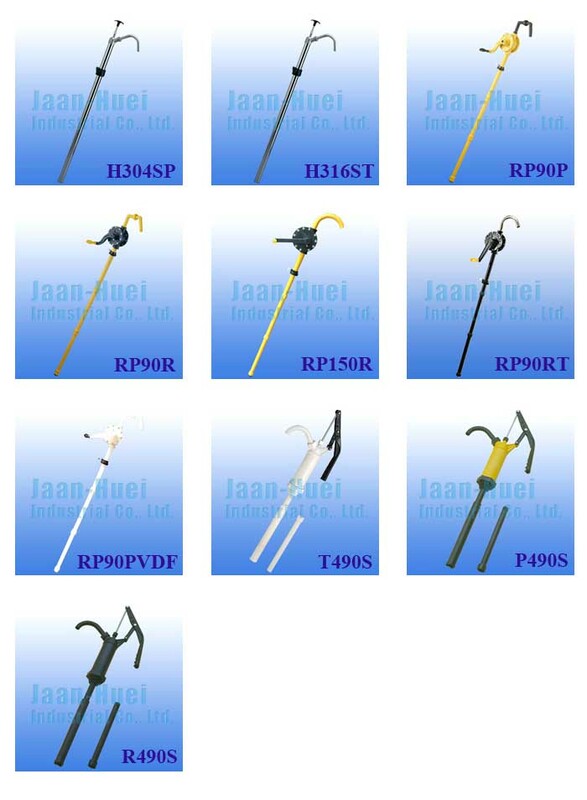 Chemical Rotary Pump (RP-90RT) - Jaan-Huei Industrial Co., Ltd.
Other specifications are the same as RP-90R. 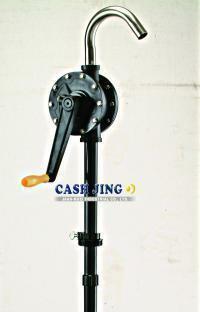 Made of PPS, this hand pump is used for weak / strong-base acid and alkali liquids-a model providing the highest oil-pumping volume amongst models of the kind (one liter per rotation; not designed for viscous liquids). Suitable for acid, alkali, etc. Applicable Liquids: Acid, alkali, gasoline, diesel, machine oil, water, and alcohol. Applicable Liquids: acid, alkali, gasoline, diesel, machine oil, water, alcohol, thinner, and other chemical liquids. Applicable Drum: 15,30 and 55 gallon containers. Applicable Liquids: For extremely aggressive chemicals and solvents, highly concentrated acids and alkalis up to 100%. Applications: Heavy oil, Machine oil, Gasoline, Food (juice, milk, wine, water..., etc). / Chemical (acid, alkali..., etc) and so on. Capacity: 22 oz per stroke. Applicable Drum: 55 gallon drum. Applications: Heavy oil, Machine oil, Gasoline, Food (juice, milk, wine, water...) / Chemical (acid, alkali...) and so on. Material: PPS, with PP spout, tube. Material: PVDF, 316SS Rod, PTFE component. Application: Very stronger acid and alkali solutions etc. Application: Same as P-490, plus water based chemicals, acid and alkaline solutions. Material: Ryton and 316SS rod. Application: Same as P-490S plus storng acid, strong alkaline solutions nitric acid etc. 950mm Stainless steel #304 cylinder body. Suitable for all soluble, corrosive, volatile & edible liquids. Most advanced non-oxidation and rust-free materials. 950mm Stainless steel #316 cylinder body. Equipped with PVDF piston and suction tube.